Ldate If you are looking for lots and lots of lesbians who are looking to date, then Ldate might be the site for you. As part of one of the largest online dating networks, Ldate has a significant membership of women actively looking for a little romance. Meet Lesbian Singles in Your Area! 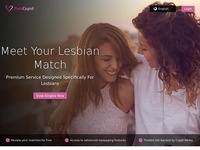 Join one of the Lesbian community's popular singles and dating personals site today to start meeting new gay women! Free to join! Free to search! Queer Buzz has thousands of exciting new lesbian member profiles waiting for you to explore. Enjoy free searching and two-way matching. Sign up now for free. Totally free email personals site for women only. Just fill out your profile, and they send email matches to you. Read and reply at your leisure. "Olivia is the lifestyle company for lesbians, dedicated to delivering extraordinary experiences, products and services that connect and celebrate the lives of lesbians." The site is in the process of adding new features "including Olivia Interest Groups, Dating, Blogs, Professional Resources, and more interactive networking tools".